Native Americans had no domesticated animals when Europeans arrived in the late 15th century. When Europeans brought cattle and sheep to the New World, they brought the Mediterranean grasses that fed their herds with them, often unintentionally. These non-native grasses spread quickly. Because so much of California was grassland when Europeans arrived, the restoration of grassland is a high priority for native plant advocates. This is the story of one attempt to restore native grassland in the Sacramento Valley. 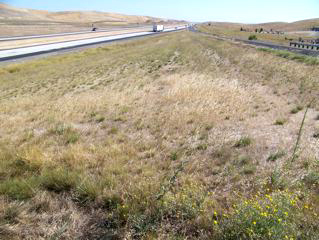 The project was funded by UC Davis and Caltrans, the State of California’s transportation department. June 2003: First-year planting declared a failure. Site was sprayed in May. 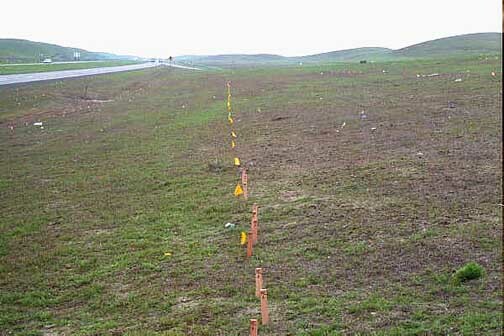 October 2003: Site is burned and re-seeded. August 2008: Yellow star thistle and wild oats are invading from the edges. Dunnigan Test Plot, Augusst 2011. The result of an eight-year effort to restore native grassland. Does it look “biodiverse?” ecoseed.com. After many years of replanting, reseeding, mowing, burning, plowing, and spraying, the 2-acre site is still dominated by non-native species and those natives which survived are not expected to persist for more than 10 years as they are overtaken by the non-natives. Using state-of-the-art-techniques and the expertise of one of the most prestigious agricultural research institutions in the world, this project must be considered a failure. The price of this failed effort was $225,000 per acre. They did the best they knew how to do. They were only trying to restore 2-acres. They spent nearly $500,000. And what do they have to show for it? A few native plants that will disappear in 10 years or less. [Edited to Add: The new sources of information also reach different conclusions with respect to the success of these restorations. Although the specific test plot described in our original source is not included in the study, many similar projects are considered successful by the new source of information. This seems to be a question of “glass-half-empty” vs “glass-half-full.” The reported results are similar in both publications, i.e., non-natives persist in all test plots and natives are not expected to persist beyond 10 years. San Franciscans who have been watching the so-called “natural areas” in San Francisco for 15 years should not be surprised or disappointed by these weed-infested plots behind fences. Why should the Natural Areas Program be more successful than the scientists at UC Davis? Given that NAP is working on tiny plots of urban land–which add up to 1,100 acres–that are completely surrounded by exotic plants, shouldn’t we expect even less success than what UC Davis could accomplish in the Sacramento Valley surrounded by acres of open space? Lower your expectations, San Francisco. Or refuse to waste your tax dollars on plowing the sea. True, it was a great expense. It was a learning experience for Caltrans. They should have talked to me first. Crait Dremann knows better. The deal is: native perennial grasses never grew in this area/soil/site prior to the arrivial of exotic annual grasses. What grew there?-probably beautiful native annual wildflowers with occasional native perennial grendilias with patches of creeping wildrye and possibly the obligate dormant Poa secunda similar to what John Muir saw when he walked across the great valley on his way to the Sierra Nevada. University of California scientists, working in their own backyard near Davis, probably knew as well as anyone which plants were the best candidates for use in their “restoration.” Since Amme worked for Caltrans at the time, they presumably knew he was available for consultation, but chose not to. While Ammes modestly proclaims he should have been consulted, he doesn’t tell us why his expertise is superior to the UC Davis scientists. To a non-professional like me, a recommendation to plant “probably beautiful native annual wildflowers” isn’t sufficiently specific to be helpful. Amme doesn’t explicitly claim, only implies, that the restoration would have been successful if they had used his vaguely identified wildflowers. I wonder if that is what he believes. In the April-June 2004 issue of Bay Nature, Amme wrote that, “. . . Mediterranean annual grasses are a permanent part of the California grasslands . . . The time is long overdue for an official naturalization ceremony.” That seems a good idea; it would spare us the futility and expense of further unsuccessful “restoration” exercises.